GemTop Truck Caps are made of steel. The professionals choice for over 50 years. in 2003 and uses the watertight doors and windows manufactured by BrandFx in their manufacturing process. GemTop Truck Caps are constructed from heavy gauge steel and are essentially leak free. 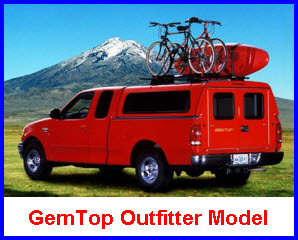 Gem Top Mfg also makes a steel laminated tonneau cover primarily for commercial purposes using the same care and durable steel construction they use in their truck caps. Custom applications for fire, plumbing, electrical, emergency services and building trade applications are no problem for the experienced designers and fabricators at Gemtop. So satisfy your need for custom designed interiors, organizers and partitions, roof racks, customized lighting, security screens, shelves and special height canopies and check out Gem Top. A tough steel cap with a cab high fit the Gemsport can be optionally fitted with lift up side doors, side doors with paddle handles, safety rotary latches and gas filled struts to assist you in opening and closing the doors. Steel tough pickup truck caps for recreational use. The economical standard for Gemtop commercial steel truck caps that costs about what an aluminum truck cap would cost. 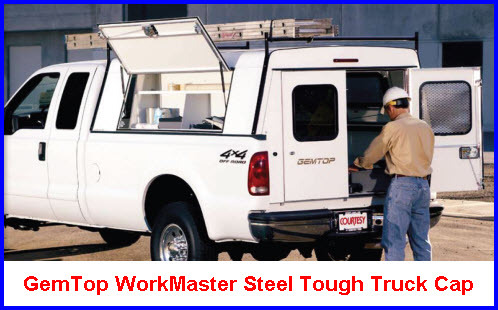 The Jobsite doesn't come with a foam insulated roof, locking rotary latches or a 12 V dome light but you get white exterior solid sides, lift up rear door, rotary latches and brake lights. Options include such niceties as OEM colors, security screens, walk in rear doors, load shift panels, ladder rack and roll out cargo drawers. Need to be thrifty, yet have the strength and durability of steel in your truck cap without breaking the budget - here you go.